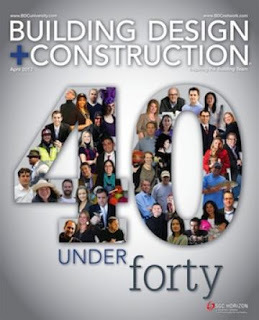 The 40 young AEC professionals featured here represent the Class of 2012 in Building Design+Construction’s“40 UNDER 40”competition. They were chosen from among 223 applicants to join the 240 previous recipients of this honor, dating to 2006. They range in age from 27 to 39 (as of December 31, 2011, the contest deadline), with a median age of 35. Seventeen of this year’s honorees are women, a high for the program. They are diverse in their professional and personal interests, as well as in their service to professional societies and such charitable organizations as Habitat for Humanity, the ACE Mentor Program, Engineers without Borders, and Big Brothers Big Sisters. We are proud to present the AEC industry’s next generation of leadership.